It's a broad church, is olde Ipswich, from All Hallows to the Zoar and most points inbetween. Foodwise, we've sat in the sun of The Sanctuary at St Nicholas, seen the psalms at the social enterprise of St Lawrence, and sat on the sofa at Suffolk Origo. In our tastes, we're nothing if not catholic with a lowercase "c". Flippin' frozzed cycling down Fonnereau Road by Bethesda. 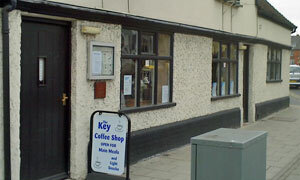 Dear me, am I glad to get inside the ex-Running Buck pub, now home to The Key, a "Christian outreach centre." Tons of tables within, a tad like the Ipswich Institute, all taken by good folk. Oh, and Grenvyle's nabbed one too. Him and the Brompton Boy are already sipping a warming brew. Today, Matthew, I'm Alberto Frog with my banana milkshake. Disappointed not to get a straw, the nice lady fetches a yellow one for me. Another nice lady takes a while to take my order for sardines on toast, brown bread, please, for a bargainous £1.75. Brief conversational interlude then G&A's orders arrive, kind of: G's crisps didn't make it (sorry, we don't do loose crisps) and A's rarebit is buck-less -- typical for Andy not to get the yolk. Soon-ish sorted with a whole pack of Seabrook's and a poached egg. Five mins, ten mins, still no little fishies. Lady catches my eye and comes over to confirm my selection. Super. On its way, she says, we've re-found your order. As visions of Froffee Coffee swim around, I contemplate slipping a scrawled PostIt into the nearby prayer box (hello, River Of Life) or having a quiet word with the "listening service" on offer. Other chaps' savouries long since vamooshed, we all order pudds, like buying Glastonbury tickets in November. Whereupon my first course presents itself: ta-da! Service for seconds is much improved as three bowls of custard-topped goodness materialise simultaneously. Top treacle tart. Coffee's ho-hum, though Andy's off-menu choice of a "milky coffee" further destabilises the waitress. Today has been a trying day for these worthy volunteers. If it was a car -- Citroen C1 with a sardine on the back. If they were passing by -- Sandi Toksvig.